As rain poured and thunder clapped, I got a cozy craving for something baked and warm. So down I went into the kitchen to make some muffins. 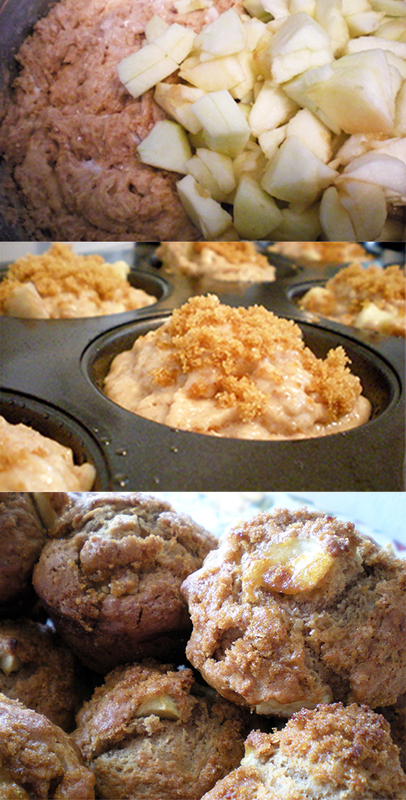 I used Smitten Kitchens whole wheat apple muffins recipe. I did change a of couple things, and I will state them below. These muffins came out incredible. 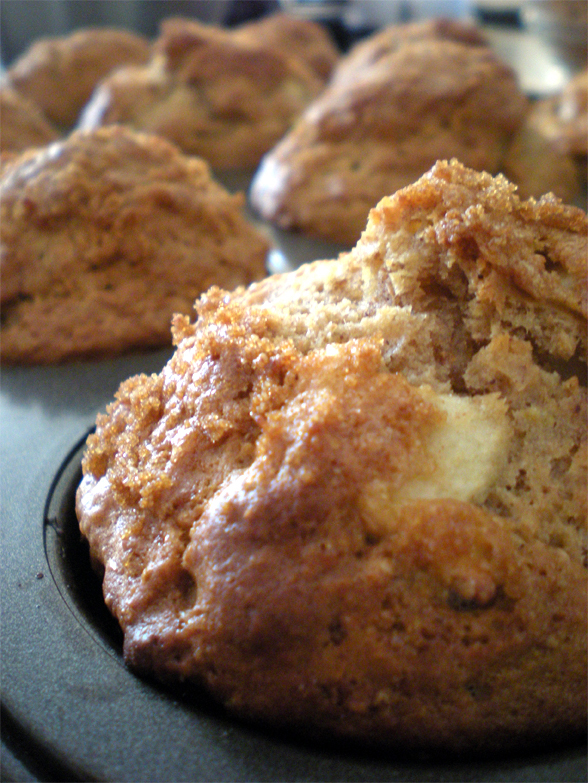 One of the best batches of muffins I have ever made. They tasted amazing and they filled the house with their delicious and comforting smell. I’m sure I’m going to make them again soon. In a medium sized bowl, throw in 1 cup all-purpose flour, 1 cup whole wheat flour and mix. Then sift in 1 teaspoon baking soda and 1 teaspoon baking powder and mix again thoroughly. Then add 1/4 teaspoon of salt and 1 tablespoon of cinnamon. Mix again. In another large bowl, put in 1/2 cup of vegetable oil, 1/4 cup granulated white sugar and 1/4 dark brown sugar. Mix well and add 1 egg. Mix again. Next, add 1 cup of yogurt and mix thoroughly. Then add the dry mixture to the wet mixture. Mix just until the flour gets incorporated. Do not over mix. Take 2 apples of your choice and peel, core and slice them into small pieces. Add to the batter and mix them in. Oil the muffin tin and divide the batter evenly among the 12 cups. Sprinkle some dark brown sugar on top of each muffin. Remove them from the hot tin and place them on a plate. Let them cool for 5 minutes, while you watch over them, drooling. They are so good. Crunchy and sugary on top and soft and fluffy inside. Plus, since I halved the sugar, they are pretty much guilt-free. Eat on. Looks scrumptious! I always love a healthy baked good. 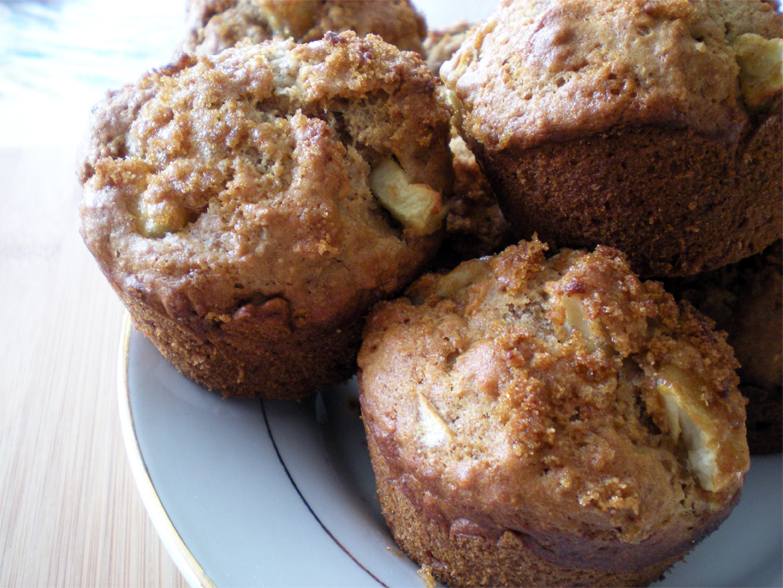 These look wonderful…and I just happen to have some plain yogurt and apples! These would be great on a Holiday morning! Reblogged this on Karen Hunt Journal. I am going to make these for a brunch I am hosting but I wanted to clarify if these should be baked at F or C. The recipe says C but that would be around 500 degrees F. Thanks! Oops, that was a typo. I baked them at 350˚F for 10 minutes and at 300˚F for 5 minutes. The original recipe calls for: 450˚F for 10 minutes then 400˚F for 5 minutes, but I lowered the temperature because my oven tends to heat up too much. Enjoy your brunch! The pictures makes me want to bake them now! Wonderful! I’m trying to bake with healthier ingredients, including whole wheat flour and fruit. I’ll definitely give these a try! Thanks for stopping by http://www.munchiesmind.com! Mmm, those look so good. I’ll give this recipe a shot the next time the apple in my garden are ripe. Haha, there’s always so many apples on the tree that I never know what to do with all of them! 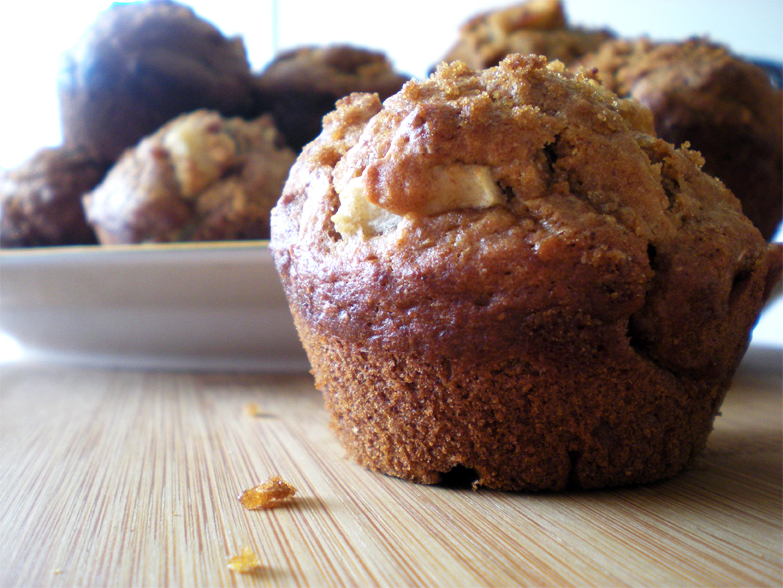 These muffins look delicious and so healthy! I will definitely try them when apples are in season.